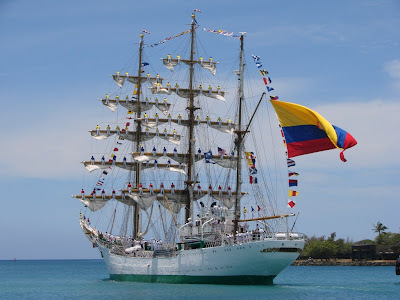 We end our series on the Colombian Navy training Tall Ship ARC Gloria with scenes from their departure from Hawaii. The top photo show the tall ship as it sails past Sand Island on its way out to Guam. 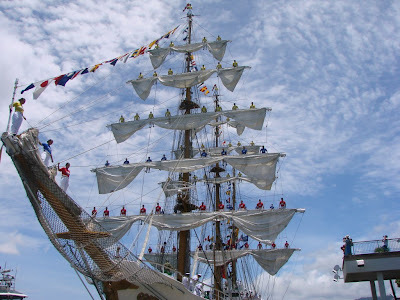 You can see the Colombian flag proudly flying and the sailors on standing on top the mast. Below is a closeup taken prior to departure. You may recall from yesterday how high the masts are and seeing the sailors perched atop the mast is just amazing. To show some size on the far right is an observation point on the second floor of Aloha Tower Marketplace. As the boat sailed out the Colombian music played as they sailed away. Of course a photo can’t do that justice so see our ARC Gloria Departure Video. This entry was posted on Friday, June 21st, 2013 at 12:25 am	and is filed under Feature, CityPhoto, cultural, Attractions. You can follow any responses to this entry through the RSS 2.0 feed. You can leave a response, or trackback from your own site.